Posted on Tue, Aug 28, 2012 : 6:30 p.m.
Editor's note: This story has been edited to indicate UMHS will have part ownership in MidMichigan Health. The University of Michigan Health System is planning to have a stake in its newest affiliate — the first time UMHS would have ownership in a partner organization, officials announced Tuesday. The agreement, which in many ways is in anticipation of the nearly 2 million Michigan residents under the age of 65 that could gain insurance coverage by 2014 under the Patient Protection and Affordable Care Act, could mean less competition for treatment at UMHS' Ann Arbor location as patients in mid-Michigan receive more specialty care locally. The heads of both organizations have signed letters of intent for an affiliation, and plan to have a completed agreement within 120 days. Under the agreement, UMHS would exchange its services and brand for less 10 percent of a stake in the MidMichigan Health system, which has hospitals in Midland, Alma, Clare and Gladwin. A new affiliation between the University of Michigan Health System and the MidMichigan Health system will give more patients in the middle of the state access to UMHS' clinical trials and new treatments for cancer and cardiovascular problems. The affiliation follows an agreement the two organizations started in December for cancer treatment. MidMichigan Health is a private, nonprofit health system that covers 10 counties. With its headquarters in Midland, MidMichigan has an A1 Moody’s bond rating and an A+ rating from Standard & Poor. In addition to its four hospitals, it has urgent care centers, home care, nursing homes, physicians, medical offices and other specialty health services. In the past year, MidMichigan has added about 50 physicians and several new clinics. Federal reforms under the Affordable Care Act spurred MidMichigan’s pursuit of an alliance, said Richard M. Reynolds, president and CEO of MidMichigan Health. is more risk assumed by provider groups in health systems, and we felt like we needed more expertise,” Reynolds said. Reynolds said the health system did not have enough “critical mass” — meaning a wide scope of services — to handle the future health care environment. Though there is no time limit to the affiliation at this point, there will be a five-year checkpoint when either party could exit, Reynolds said. Part of the agreement will involve a complex set of performance metrics that could increase UMHS’ share in MidMichigan, Reynolds said. “It’s a contribution of the brand as well as a number of services, and then the opportunities to earn additional services,” Reynolds said of the agreement. Pescovitz said UMHS chose MidMichigan Health to be an affiliate because the systems share the same values of patient safety, quality of care and the pursuit of decreased health care costs while maintaining a good track record and healthy finances. The affiliation does not change the geographic reach of UMHS because the health system already receives many referrals from that part of the state. Rather, it solidifies the relationship UMHS has with physicians in the area, Pescovitz said. Reynolds said it’s difficult for patients referred to UMHS to get care there because of high demand. The new affiliation is one he hopes will give MidMichigan patients better access to UMHS treatment. MidMichigan will retain local control of its health centers. Whether the U-M logo is added remains to be seen in the agreement details. Reynolds said MidMichigan hopes to be a regional cancer center in the future. but we don’t have enough volume to maintain specialists in cancer treatment,” Reynolds said. The affiliation will mean UMHS specialists will travel to MidMichigan health centers to see patients and save them a trip to Ann Arbor, Reynolds said. It will help ease the patient load on the high-demand Ann Arbor hospital — a move Pescovitz supports. Pescovitz emphasized that the affiliation with MidMichigan would mean UMHS would be seeing “only the patients that need to be seen” for specialty care by extending a higher level of treatment options to providers in outlying areas, noting a shortage of beds at the Ann Arbor location. The overall goal is to decrease the cost of medical care in Michigan by reducing the number of re-admissions to the hospital though maximized local care, Pescovitz said. However, offering a certain level of expensive specialized care — like transplant procedures and pediatric surgeries — in hospitals across the state “does not make sense,” Pescovitz said. “There are certain things that need to be consolidated centrally,” Pescovitz said. Patients in the MidMichigan Health system will have better access to advanced cancer and cardiovascular treatments at UMHS, especially in regard to clinical trials and cutting-edge treatments. UMHS has a long list of organizations and health systems with which it partners, but has not invested in them financially. UMHS has a signed partnership with Trinity Health System, as well as two alliances it has helped to create with other health care providers in Michigan. The health system also has agreements for specialized care in several other Michigan hospitals. Wed, Aug 29, 2012 : 1:15 a.m.
Hey AnnArbor.com, can you find out how much public money is going into this venture? The last time I checked, UMHS was part of a public university. It would be interesting to learn how this public/private venture might work. 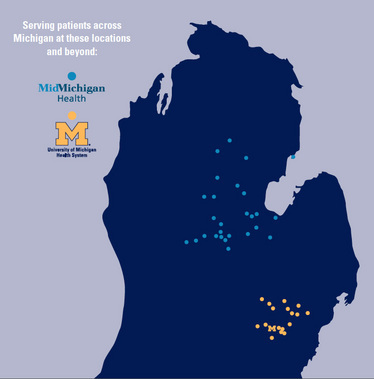 @MichiganMan, the U of M attracts patients from far across Michigan. You might be surprised how many people travel all the way to UMHS for care. Its a lot. Wed, Aug 29, 2012 : 12:40 a.m.
^ So you're against allowing children to be on their parents insurance until they're 26? Or you think people should be denied insurance because of pre-existing conditions? Or you're against providing subsidies so the uninsured can buy private insurance through the market? Maybe you're against negotiating Medicare savings with hospitals and health systems? There's something you don't like... Can't figure it out, tho. Wed, Aug 29, 2012 : 1:16 a.m.
Tue, Aug 28, 2012 : 11:35 p.m. I would venture a guess that they are either rolling in the dough of cash flow, or have large profits due to Obama care coming soon. In any case, who can effectively reject and contest any increase in health care cost that they mandate of their populace? We are powerless, unless we see a change in the leadership in our US government. God Save the Queen – oops, wrong country! God Save Obama – oops! God, I hope we change leadership before we go bankrupt. God save us from ruin! Tue, Aug 28, 2012 : 11:30 p.m. This seems like a stretch. This alliance will fall apart in due course. Just cannot see Ann Arbor academic physicians moving to Clare, Gladwin and Midland. Cannot also see patients from that part of Michigan driving 150+ miles, past countless other Michigan hospitals so that they can marvel at U of M. Weird business relationship.